- 10 % discount until 30 November 2018! 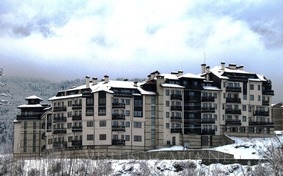 Location: All Seasons Club Aparthotel is located in Bansko ski resort, 900 m from the first station of the Gondola lift - at 30 minutes walking distance and 5 minutes by car. Nearby the hotel is situated St. Ivan Rilski complex. Accommodation: Аll Seasons Club is an apartment hotel complex with 15 studios, 40 1-bedroom apartments and 12 2-bedroom apartments. Studio consists of one premise with folding sofa and fully equipped kitchenette, bathroom with a bath-tub and WC. Maximum occupancy – 2 + 1 persons. 1-bedroom apartment consists of two premises – a bedroom and a living room with folding sofa and fully equipped kitchenette, bathroom with a bath-tub and WC. Maximum occupancy – 2 + 2 persons. 2-bedroom apartment consists of three premises – two bedrooms and a living room with folding sofa and fully equipped kitchenette, bathroom with a bath-tub and WC. Maximum occupancy – 4 + 2 persons. Room amenities: The guestrooms offer cable/ satellite TV, refrigerator, mini-bar. There is an additional charge for using the cooking facilities – 5 Euro per day. Linen is changed 3 times a week. Hotel facilities: Lobby-bar, lift, restaurant, reception, security, daily maid service. Relax centre: At guests' disposal are swimming pool, sauna, steam bath and massages. Conference facilities: The conference room features 40 seats, multimedia and screen, microphones, professional sound system, Wi-Fi Internet connection and TV.